To celebrate the 25th anniversary of The Elder Scrolls franchise, its beloved third instalment – Morrowind – is free for you to download and keep, but only if you claim it by the end of the day (March 25). As publisher Besthesda explains (via Polygon), you’ll need to head over to Bethesda.net, log in, and redeem the code: “TES25TH-MORROWIND” to add the game to your account. That’s all there is to it. Released in 2002, Morrowind is pretty seriously dated at this point, but it remains one of the most popular episodes in the long-running series of open-world fantasy RPGs. Its story concerned a god who lived in a volcano and dreamed of shattering the Empire’s grip on the titular province, but it was the first game in the series to place a similar emphasis on its side quests. This marked a decisive move toward the free-form style of gameplay that made successors Oblivion and especially Skyrim such successes. Even story-critical NPCs could be killed, with only a warning from the game advising you that you were about to stuff your playthrough. If you’d rather experience Morrowind in more up-to-date technology, Skywind is a community mod that aims to recreate it within the Skyrim engine. It’s been six years in the making so far and still isn’t finished, but if you think that’s dedication, Rebirth aims to improve the base game with a myriad of tweaks and additions. It’s taken nine years so far and its creator is unsure if it’ll ever be finished. 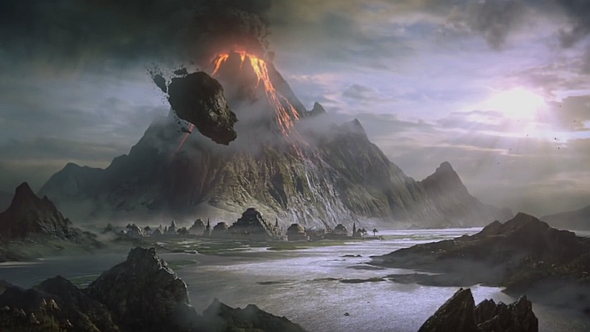 Besides free Morrowind, Bethesda is offering more for The Elder Scrolls’ 25th birthday. Elder Scrolls Online players can play the prologue to its coming Elsweyr chapter for free, while the game itself is having a play-for-free event from March 28 to April 3. Head to Bethesda for more details. There are also freebies available in The Elder Scrolls Legends, Skyrim Special Edition, discounts on Elder Scrolls games, and plenty more.